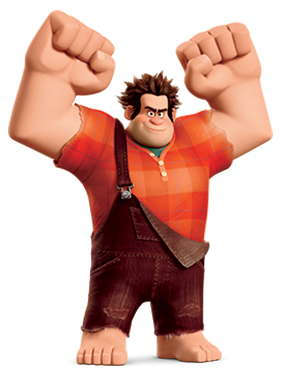 Walt Disney Animation Studio’s newest release – Wreck-It Ralph is a computer-animated tale directed by Rich Moore about an arcade game “bad guy” who wants nothing more than to be the “good guy”. Wreck-It Ralph, which hit theaters on November 2, 2012, is being released in over 42 languages and 71 markets worldwide. To win the game of today’s complex global releases, there are many teams of “Good Guys” across Disney that have a hand in preparing the various aspects of a film as it takes its own journey from creation to release. DDSS is charged with backstage technical and operations roles in helping to create and deliver elements across many of our films and Wreck-It Ralph was no exception. We played an important role in ensuring the delivery of language masters, localized title cards and the audio deliverables necessary to create world-wide elements for Theatrical, DVD, Blu-Ray, Video on Demand and Electronic Sell Through. In addition, at a number of steps along the way from Audio Language elements, to Digital Cinema versions and files for downstream servicing, Disney Digital Studio Services provided QC Services – those Disney “Golden Eyes and Ears” that make sure that audience see and hear the quality for which Disney is known. Releasing a film like Wreck-It Ralph literally takes a global village. Digital Studio Services is part of the Studio Operations team at the Walt Disney Studios. Our Studio Operations President, Jeff Miller built the operations organization on the foundation of his vision for world-wide release featuring local star talent and ways to deliver a film that literally speaks to the audience in the language they understand with the quality that audiences have come to expect from Disney. Through this vision, and a lot of hard work over the past 24 years, Jeff and his team literally created the industry model for world-wide theatrical releases. When you think about what it really takes to get a film into 71 countries and in 42 languages it boggles the mind. From coordinating the logistics in partnership with our International territories, to hiring translators, casting local voice talent, working with our international vendors to record these voice tracks and then mixing or (“dubbing” as it is known) to match all of the levels and characteristics of the music and sound effects so that the local language track sounds like the one the filmmakers created for the domestic version, creating specialized localized language inserts, as well as subtitles for those countries where there is not a “dubbed” track, and then creating all of the film and digital elements that create each local version – and have all of this ready so the film can be released all over the world, mostly on the same day – well, that is a game our Studio Operations team plays to win. The players at Disney Digital Studio Services work proudly as part of our Studio Operations team with other groups within “Studio Ops” such as Disney Character Voices International. DCVI handles all of the local translations, including making sure that the nuances of the script are translated into the local idiom, to the point that when certain comedy or story points quite literally get lost in translation, appropriate local references that respect the creative filmmaker’s intent are developed to make sure international audiences understand the story points. DCVI oversees all of the talent casting, recording and dubbing. This is the team that helps to make sure that we sound our best in every language. Disney Digital Studio Services also works closely with our Library and Technical Services team who oversee and coordinate all of the various elements that become the masters that service the deliveries of the film and home entertainment elements all over the world. As our “Library,” they keep track of, service, and are responsible for the long-term archive so that generation after generation can continue to enjoy our films in the most pristine form possible. These “Good Guys” also oversee the amazing restorations of Disney’s classic animated films and through our re-mastering efforts, make sure that the live action films of the recent and not so recent past look and sound sometimes better than they did on they day there were released. We also parter with another part of our Studio Operations team, our Motion Picture Operations team who handle our “supply chain” including the global operations that facilitate deliveries to literally every place on earth that receives, sells, distributes and exhibits our films. They make sure all of the domestic and international versions, with dubbed tracks and subtitles are made on film, digital cinema, DVD, Blu-Ray and other digital delivery elements. They oversee the extremely complex process of getting these elements to the theaters, warehouses, stores and online portals so that audiences never have to worry about how our content got there – they just enjoy our films anywhere and in any form. Working with Disney Character Voices International and Library Technical Services, our DDSS Audio Mastering Team ensures that audio deliverables meet the immediate demands of worldwide Theatrical Film and Digital Cinema as well as the soon to follow Home Entertainment release. Utilizing a Disney developed technology called Transfer Manager, all of the international language tracks are delivered through a high-speed connection that automatically checks that the files are named correctly, so that hey can be “checked into” our Library and are in the proper format for the next step. Transfer Manager delivers these sound files directly to our Digital Studio Services Digital Audio Mastering team who begin the work to conform and transform these language tracks so that they are ready for Digital Cinema and Home Entertainment. The DDSS team prepared and then performed quality assurance and quality control checks on the 245 audio elements that will service Wreck-It Ralph’s theatrical and home entertainment releases worldwide. To help our international audiences have a deeper and more meaningful experience with our films, Main and End Tittles as well as language related on-screen items are localized so that to international audiences it appears that the film was literally made in their language. Disney Digital Studio Services Film & Digital Services’ Title / Graphics team collaborated with Wreck-It Ralph art director, Ian Gooding to create localized title cards, the End Crawl and all of the localized inserts for the film. The DDSS Film & Digital Services’ Title / Graphics team also played a critical role in the design of localized inserts for Wreck-It Ralph. An insert is comprised of any word, banner, or sign that is critical to the story that needs to be translated in a foreign language. There were several instances in Wreck-It Ralph where an insert was needed. One such instance involved a scene where the character Q’bert holds up a small sign that reads, “Game Unplugged.” Because the sign was vital to the story, a decision was made to translate it into multiple languages. In total, Disney Digital Studio Services created over 170 inserts for ten territories. The End Crawl, also known as “Closing Credits” are added at the end of a movie and serve to credit the major contributors of the film including the actors, the production crew, the technical crews and many others. In a sense, the crawl is its own special ending and may include artwork, bloopers, and/or teasers to set up a sequel. In the case of Wreck-It Ralph, the end crawl was artful and followed themes inherent in the film. The Crawl had to be conformed to artwork that lived on the edges of the screen and was divided in sections that pertained to the different “Lands” in Wreck-It Ralph. Each land had a unique look with artwork that ranged from straight, diagonal to curvy lines and text to match. Unique to Wreck-It Ralph was the creation of a new 8-bit font, designed by our Film & Digital Services’ Title / Graphics team. After experimenting with several different fonts, the Title Graphics team designed an entire alphabet to match the style of the movie that was not only used in the end credits but also in several of the inserts for Wreck-It Ralph. (The section headers in this article were made using this “WRECK-IT RALPH” font.) Matching the End Crawl to the artwork in the film and the design of the custom “WRECK-IT RALPH” was an artistic process and a collaboration between the DDSS Film & Digital Services team and the Feature Animation production crew. Those Disney “Golden Eyes and Ears” provided Quality Control services at every step of the way in the delivery of Wreck-It Ralph. Upon receipt of the final Digital Cinema as well as home entertainment master packages, the QC team provides assurance that the image and sound conform to Disney’s own high standard of technical excellence. The QC team is comprised of experts in image, sound and technical specifications and perform comprehensive evaluations to ensure that our audiences experience the films that our filmmakers make with such artistic craft in the way in which they intended. It is only when these elements pass the rigor and high-bar standards of our QC team, that these elements are ready for next step servicing and can then be checked into the Library and Archive, with confidence that these elements can truly stand the test of time. As part of the larger Studio Operations team, our goal at Disney Digital Studio Services is simple, which is to help make all of these complex processes transparent to both our audiences and to our colleagues across our organization. As players on this larger Studio Ops team, we “pass the baton” to each other many times across the milestones of motion picture production, post production, finishing and delivery. By complimenting each other and making the seemingly impossible, difficult – but doable, the players in this game score a huge win for our Studio and our audiences. Enjoy Wreck-It Ralph no matter where you are in this big wide world. Disney Digital Studio Services sure had fun playing this game.